Stop Halloween from spooking your dog. It’s not just us that are spooked this month because of Halloween, but our dogs are as well. Explaining why this month is so dangerous for our dogs is Richard and Vicki Horowitz from Bark Busters along with Charlie, a two year old lab mix rescue. Halloween can be a nightmare-from oddly dressed squealing kids and strangers ringing doorbells to unusual commotion in the neighborhood-all packed into one action-filled night. Dog owners may not be able to control external surroundings, but they can care for their dog’s safety and well-being. The best thing you can do for your dog when he is feeling unsettled by Halloween activities is to act as you normally would around your dog. By over-reassuring your dog or giving him an unusual amount of attention, you inadvertently can communicate to him that because you are acting differently, there must be something to worry about. Have your dog get used to costumes. 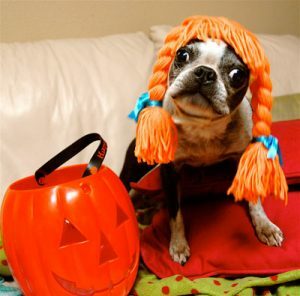 Your dog may see his family members as strangers once they don their Halloween costumes. Before the kids put them on, allow your dog to scent the costumes. If your costume has a mask, keep the mask off when you are with your dog because dogs can become confused when they can’t see our faces. Don’t leave your dog outside. Even if you have a fenced yard, bring your dog inside where it is safe. If your dog is usually kept outside, bring him in a few times before the big night to get him used to being indoors. Sometimes a sudden change can put more stress on a dog. If your dog cannot come inside, ensure your dog has a safe place to go, like a doghouse. Your dog may be used to strangers, but so many little ghouls and goblins running about may be too much. Remember also that it is a natural instinct for dogs to protect the family from strangers, and on Halloween there will be no shortage of strangers. Think twice about dressing your dog in a costume. While some dogs might enjoy being dressed up, many don’t. Experiment first to see if your dog likes being in a costume. If so, fine-he’ll most likely enjoy himself and the extra attention it brings. Many candies-especially chocolate-are toxic to dogs. The severity of the toxicity depends greatly on factors such as breed, age, size, and how much candy was ingested. Problems may range from a mild upset tummy to vomiting and diarrhea, or even ingested. Problems may range from a mild upset tummy to vomiting and diarrhea, or even death. If you have any concerns at all, consult with a veterinarian immediately. If you want to keep your dog safe, make certain that sweets, including their wrappers, are kept well away from your dog. A wad of wrappers can block the intestinal tract-a very dangerous condition.